laws and land acquisition, former Niti Aayog vice chairman Arvind Panagariya has said. He said Indian economy grew 7.5 cent in the first three years of the Narandra Modi government, but two major reforms - demonetisation and goods and services tax - brought the growth rate down a little. In the current fiscal, he said, India will end up at 6.5 per cent, which is also a pretty good growth rate. "By all accounts, I have no doubt that (India) will get back to eight per cent plus (growth rate). India really today is probably the only game in the town," the professor of economics at the prestigious Columbia University said while addressing the inaugural "New India" lecture series, launched by the Consulate General of India here. The "New India" lecture series is inspired by Prime Minister Narendra Modi's vision of a new India by 2022. It is an initiative of Indian Consul General Sandeep Chakrabarty. He said that although China is probably growing at 6-7 per cent but its rate us likely to decline to five in the years to come. Panagariya said that India will sustain its high growth rate for the next two decades at least with the current trajectory of reforms, unless it starts making mistakes again. He also said that India is headed to become the world's fifth largest economy and there was no doubt that the country has got the potential to do 10 per cent. "Certainly, there is no doubt that we have got the potential to do 10 per cent. "For India to achieve the double-digit growth, the country needs major reforms in labour and land acquisition laws. It also needs significant privatisation and a major reform of civil service, which is quite not sufficient to handle the large economy that India is now," Panagariya said. To a question on next budget, the former Niti Aayog Vice Chairman said that the next budget is unlikely to be different from the previous budgets. "It would be reform-oriented budget in my view. I think there is a lot of talk about reaching the fiscal consolidation plan. Expecting that the budget will give clear indication of reforms," he said, adding that the agriculture sector could see more emphasis in the upcoming budget. "Unemployment in India is not very high. Jobs are being created, but as the way policies were being adopted in India, in the end it gives very little incentive to employers to employ people in the formal sector." "This is a long standing problem in India." 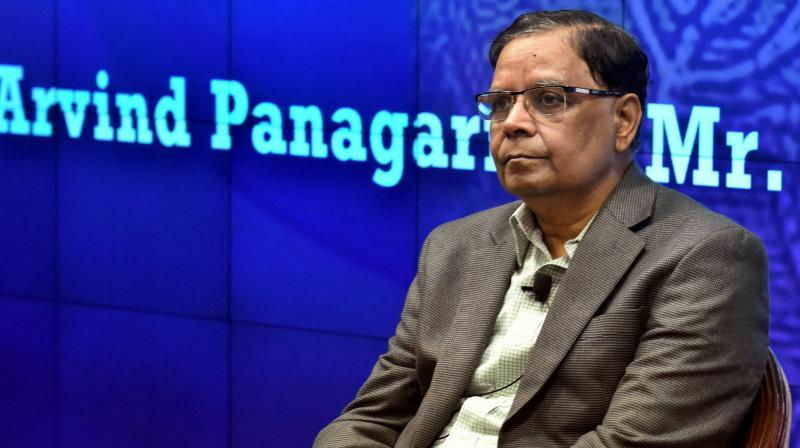 Panagariya said he enjoyed his three-year term in India as the Vice Chairman of Niti Aayog, and he would have stayed longer, if he did not have a permanent job at the Columbia University or the varsity would have given him a longer leave. He described as "scandalous" a number of loans being given without any collaterals. "It is scandalous. What kind of culture are we promoting absolutely unforgivable If one looks at the banks situation, default by the farmers are relatively small. "The problems are all coming from large industrialists, but this government is not letting them go. This government is very tough...The Prime Minister is very tough on the corruption issue," he said.